Date of 2007 London-Brighton Commercial Run ? : On May 6th. Lovely photos received from Robert Gillespie of Sheffield (UK) who had bought a magic lantern slide projector with five wooden boxes of slides, - no family connection. Two were showing a car with reg D-2402. He thought they would be interesting and that we could identify make and date. Can advise registration D-2402 was issued by Kent County Council in 1906. Car has been confirmed by our Star expert John Warburton as being a 1906 Star 7 HP twin cylinder, which gained the radiator in 1906. Another of a series of photos received from photograph collector David Cox (UK) with a request for dating and for identification. This one is a a bit of a puzzle. Registration AB 1783 is a Worcester County Council registration issued 1911 (numbers 1673 TO 2169). The car, however, is much older than the registration. The car is a cca 1906 Rover 6. We can only assume that the car was sold and re-registered in 1911, and previous owner probably may have wanted to keep the registration. Some of our enquirers can make our life difficult. Tiny photo received from Frances Miller (Ireland) and no responses to our requests for better scans. We need high resolution scans please especially if the photos are small. Photo was taken in the Totteridge area of North London and the registration is LD 9425. The registration LD was issued by the London County Council between May 1909 and April 1910. The car is a 1909 Rover 15. They are trying to reunite the album with the family. Another of a series of photos received from Maggi Wilson (USA). We had asked for a better resolution photo but had not received any. The car in the picture is a 'boy racer' conversion on a large chassis, so is a 'special'. 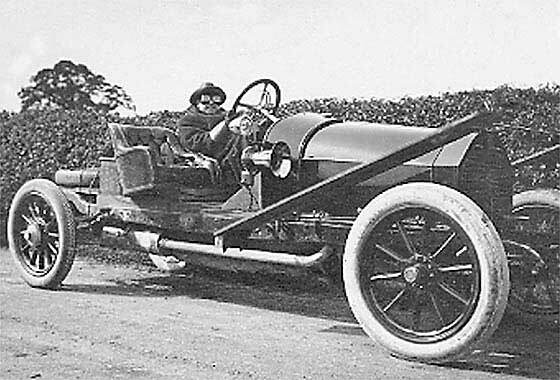 Subsequent photos have defined that the car is a cca 1910 Peugeot. The unusual hub of the rear wheel had suggested a Vinot & Deguingand. Common component supplier? 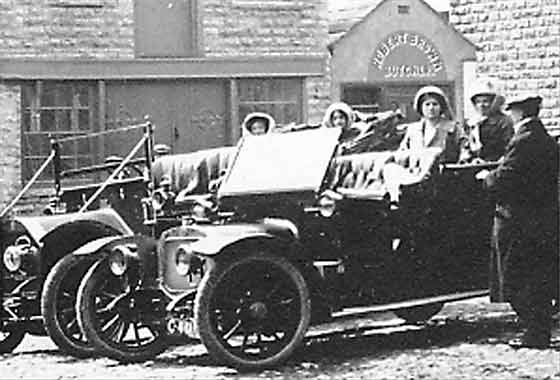 This could be a later photo of the conversion of a similar car shown on one of her earlier photos. Another of a series of photos received from Maggi Wilson (USA). This is a left-hand drive car photographed by the cable car station at Charlannes, France. 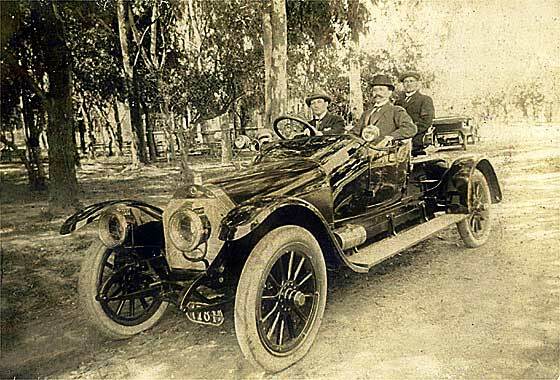 The car is a French cca 1910 Hotchkiss. Hotchkiss was an American weapons maker who came to France and eventually developed the heavy machine gun adopted by many countries. The company started car manufacture in 1903 and also had an armored machinegun vehicle in 1909. The company logo was two crossed guns. One of a series of photos received from Maggi Wilson (USA) whose family owned an apartment complex in the USA and the photos belonged to a tenant who died without any family. The car again has the 'C' registration which were issued by Yorkshire County Council. The precise dating records have now been lost. 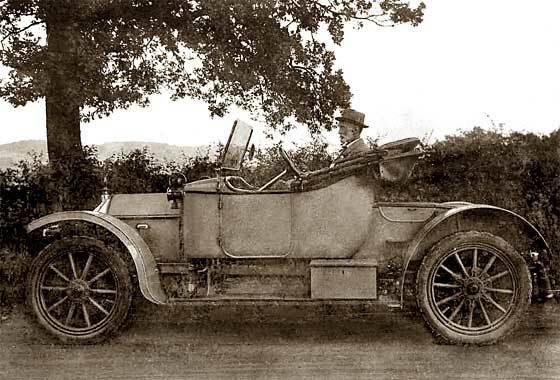 The car is a 1910 Sunbeam 12 next to the Humber previously identified. The owners must have been motoring enthusiasts because most photos show groups of cars. Photo received from Nigel Gibbins (UK) showing his great grandparents car. From the age of his grandmother he thinks it was taken around 1910. The picture was taken in London. We can advise that the registration shown as LE 5046 was issued by London County Council between June 1911 and May 1912. 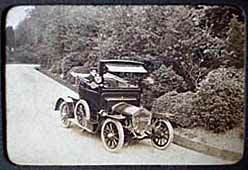 The car, which is a Rover, looks quite new, and would therefore be a 1911 Rover 6. There is no record of car on the DVLA database so unless abroad, it has probably not survived. Photo received from Steve Walters (UK) removed from an album with another dated 1919, taken in the village to Kirby Muxloe, and found on Ebay. 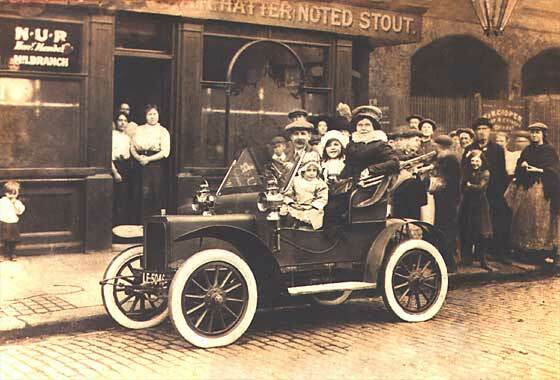 The car in the photo is a cca 1913 Metallurgique 10/12 made in Belgium by a railway engine manufacturer much of whose production came to the UK with Vanden Plas bodies. The ' V ' type radiator stayed as their trademark from 1908 to the end in 1927. Metallurgique were the third most important car maker in Belgium, after FN and Minerva. Photo received from Carlos Tarrico Villafañe (Argentina) showing his grandfather Pedro Tarrico which has taken a long time to identify. 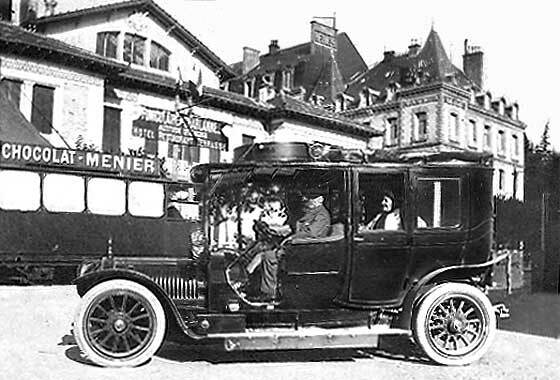 Suggestions were put forward as to the make but we are now pretty sure that this is a cca 1913 Berliet 25HP with possibly a local sports two seater body or made by Locomobile. Berliet was a French manufacturer who started in 1894 and was subsequently better known internationally for manufacture of large lorries, merged with Saviem/Renault in 1978. Another of a series of photos received from photograph collector David Cox (UK) with a request for dating and for identification. 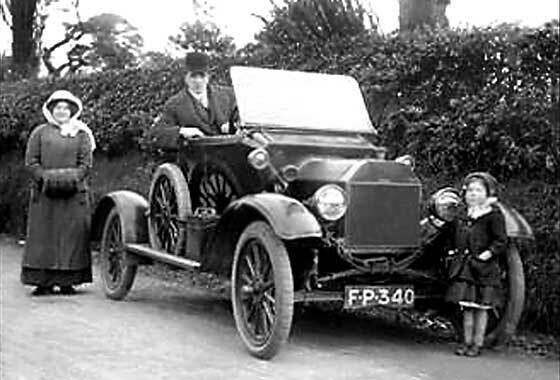 The car is a 1913 Ford Model T. FP 340 is a Rutland County Council registration issued in 1913 (numbers 330 to 412). It was spotted by our Tim Harding that the mudguards are non standard and he also noted that in his records of Rutland for this period, FP 340 is the only one that is shown blank? Check with DVLA advises that car is no longer on their database. Photo received from Ruth Baumberg (UK) advising she is writing a book about Joseph Walmsley, designer of ceramics and tiles at Burmantofts in Leeds. Picture shows a works outing she was trying to date. Joseph Walmsley left Leeds in 1917 for Manchester as wallpaper designer so it must be before that date. 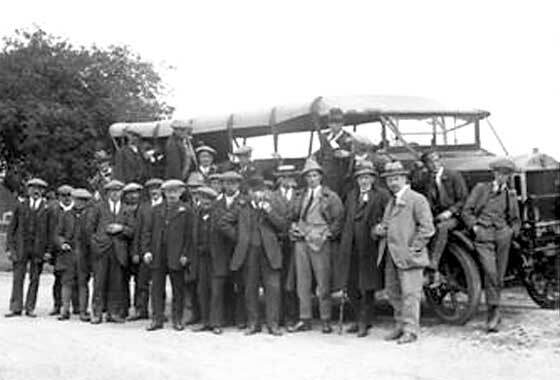 We can confirm that the vehicle is cca 1913 Leyland Charabanc, see similar bus. Registartion BT 391 was issued by County Council of the East Riding of Yorkshire, but no dates available. Another of a series of photos received from photograph collector David Cox (UK) with a request for dating and for identification. 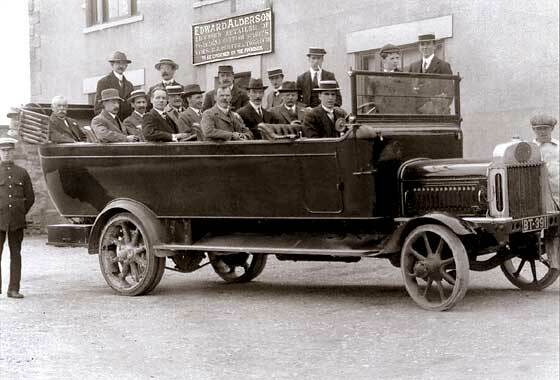 This is a lovely photo of a gents only outing in a cca 1916 Maudsley Charabanc. This took a bit of identification because the photo is very low resolution providing little detail. We need hi res photos please. When the radiator section was enlarged it was still confusing because it was eventually established that a AA badge is positioned as would be a radiator badge. A Photo received from Annette Hughes (UK) from her grandfather's collection. It shows a vehicle depot, possibly railway or removals, with some very unusual heavy vehicles for UK. 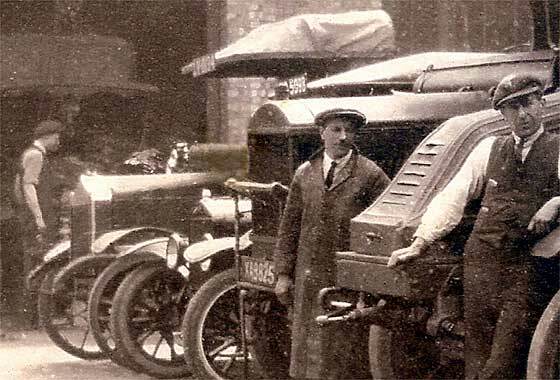 We have already identified the vehicle on the right as being 1919 Kelly-Springfield but have now enlarged and our Tim Harding thinks the vehicle on the left is a cca 1919 Hallford, made by J & E Halls, the smaller lorry being a Ford Model T, and the one with the large radiator from reg. no. to be a 1920 Maudslay. Another tiny photo received from Frances Miller (Ireland) and no responses to our requests for better scans. We need high resolution scans please especially if the photos are small. No registration is indicated so no precise dating can be obtained from it. The picture took quite a lot of searching to identify, but our Tim Harding has come up trumps again and has advised that it is a cca 1921 Calthorpe 10 Two Seater. Calthorpes were made in Birmingham between 1905 and 1926. A Photo received from Robert Rioux (Canada). The image comes from a Buster Keaton movie called Seven Chances that was made in 1952 in Los Angeles. 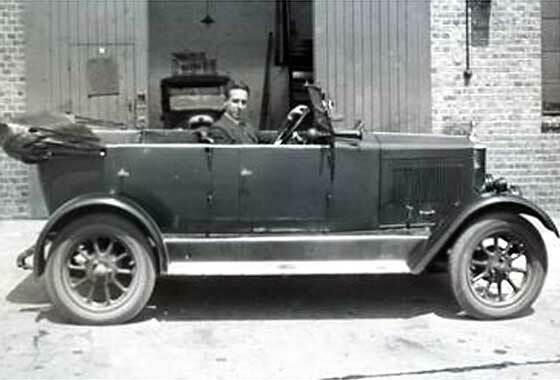 Robert is a big fan of silent movies, especially Buster Keaton, and just loves this car which he believes was from around 1925. He wanted to know what it was, but came back with the answer before we got back to him. He identified it as a cca 1922 Mercer Raceabout but we think it is a little earlier because it has the shallower headlamps. Photo received from Gerald Peake of Vancouver (Canada) who is doing some investigations for the family history tree. His Grandfather Fred Peake seems to have lived an interesting life so he is trying to learn everything about him, - including what he drove. The picture was probably taken somewhere in Staffordshire. We can tell him the car is a magnificent cca 1923 Sunbeam 24/60 (24/70) Light Sports. We cannot see enough of the numberplate to determine reg area or confirm year. One of two photos received from Alan Mack (UK) showing a motorbike and a car. We have twice requested an enlargement of the bike but no answer. 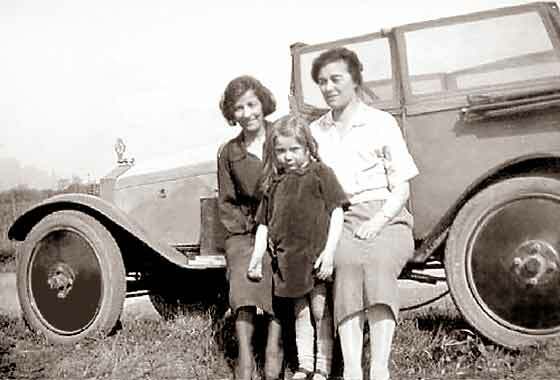 The car is a mystery; it was not owned by the family and except for his mother, he does not know the people. 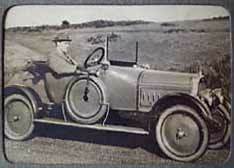 Photo shows an extremely unusual car identified by Tim Harding as a cca 1925 Eric-Campbell. Made initially in Handley-Page aircraft factory Cricklewood, then in Southall, London, these polished ally sports cars raced in the 1919 Targa Florio. Another of a series of photos received from photograph collector David Cox (UK) with a request for dating and for identification. Unfortunately the registration number and the photo is not clear so precise dating is not possible. Our Tim Harding suggests the car is the last of the Bullnose Cowleys and therefore the car would be a 1926 Morris Cowley Bullnose. We originally thought earlier. The boot carries a Dickey Seat. About 150,000 'Bullnoses', including Oxfords, were made 1919-1926. Another of a series of photos received from photograph collector David Cox (UK) with a request for dating and for identification. 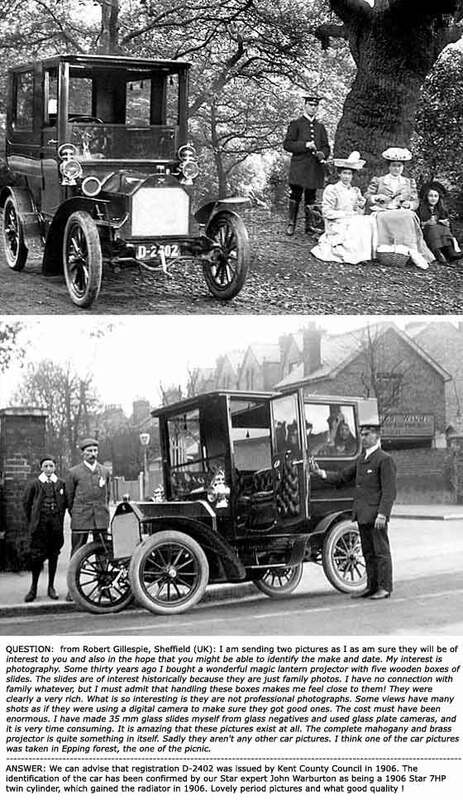 Interesting to note the quite dramatic change in fashion of car body design as indicated in this photograph compared to the one below, despite these being only one year apart. The car in this photo is also a Cowley but is a cca 1927 Morris Cowley Flatnose. These were made until 1930 and with Oxfords accounted for 185,000. The 27 Cowley still had no front brakes. Another photo received from Gerald Peake of Vancouver (Canada) taken at one of his great grandfather's properties in Staffordshire. 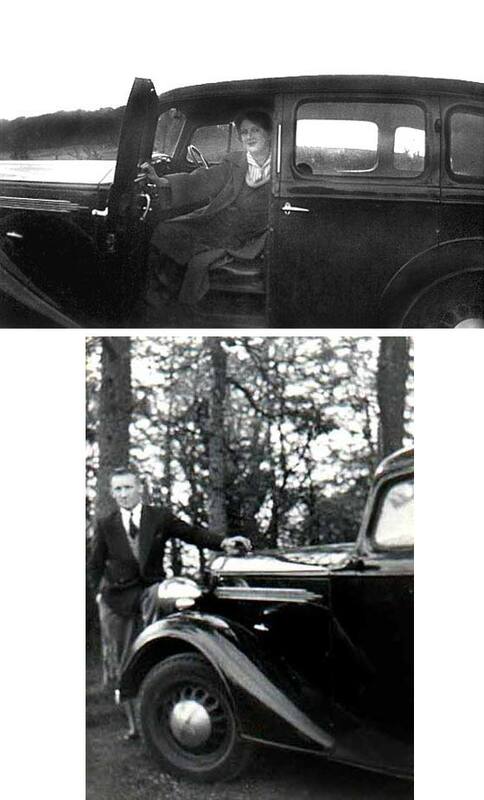 The man in the car is his great uncle. Registration AVT 494 was issued by Stoke-on-Trent County Borough Council. Identifying cars from the back is very difficult but from the motif on the right rear wing, our Tim Harding has identified it as a 1934 Vauxhall Light Six. There is another car reflected in the paintwork, but not enough detail to try to identify. Photos received from Chris Hevey (UK) who is trying to work out who the people in the pictures are as part of a project to reunite my family spread apart in the 1940-50s. Dating the car would really help date the pictures. 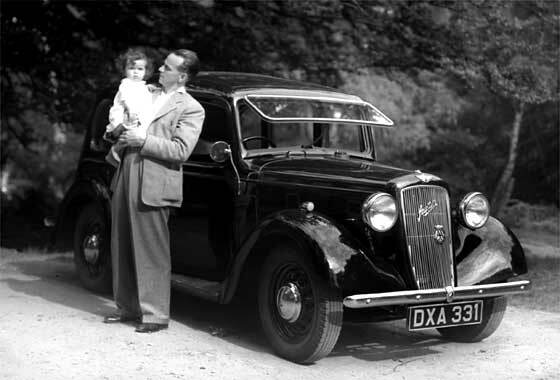 Can advise that the car would appear to be a cca 1938 Vauxhall Light Six. Made just before WW2 so not used during the war and would be 'new looking' when taken out in 1945. My guess on fashions is that the pictures are post war, possibly even early 1950s. Another of a series of photos received from photograph collector David Cox (UK) with a request for dating of the numberplate and for identification of the car. He did not recognise this one although the massive double chevron should have given it away. The car is a 1933 Citroen 10 CV Saloon. Registration ANO 261 was issued by Essex County Council between June and August 1933. No longer on DVLA database so unless abroad, has probably not survived. Citroen had a base in the UK. Photo received from Kerry Coulter from Ottawa (Canada) of a car that has been intriguing him. The photo came from a friend who collects/restores old Citroen cars and they thought it looks a little like a Citroen DS. Could we determine the make, model & year? 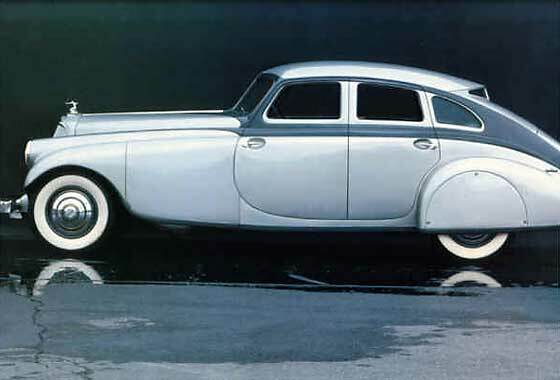 This one is relatively easy as the car is one of the design icons used in styling discussions. It is a cca 1933 Pierce Arrow, Silver Arrow. These were introduced for the New York Auto Show, and only five were ever made. Two more photos received from Ian Todd (UK) showing other cars owned by Brenda Colvin (see below). Photos are a bit blurred. 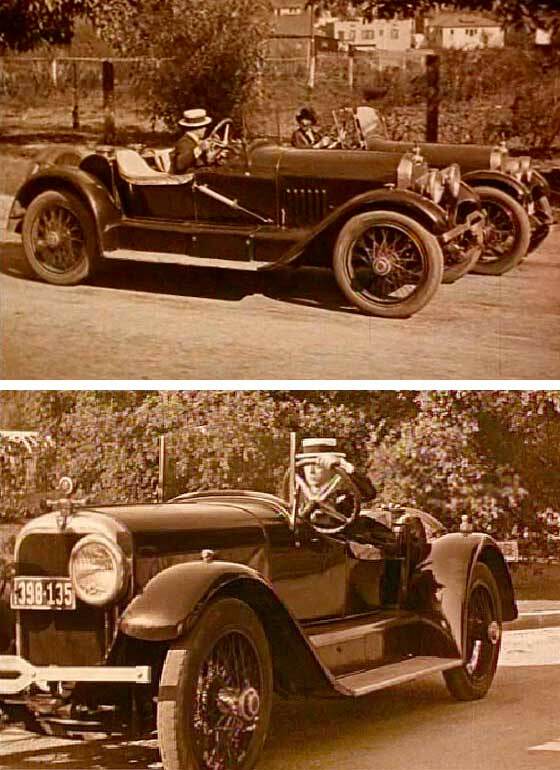 The car shown right is an earlier car. 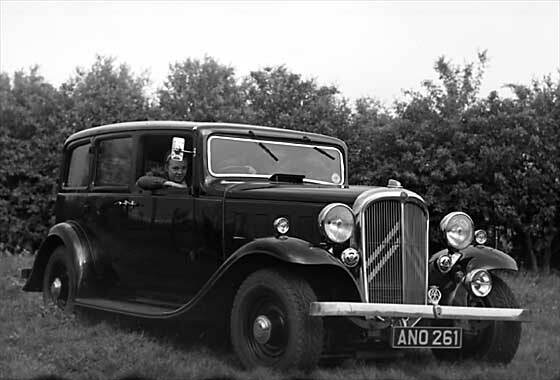 The photo shows an Austin with a painted radiator shell, it has a boot lid, and has individual bonnet vents, which suggests an a cca 1936 Austin Light 12/4. These also had the name Ascot. 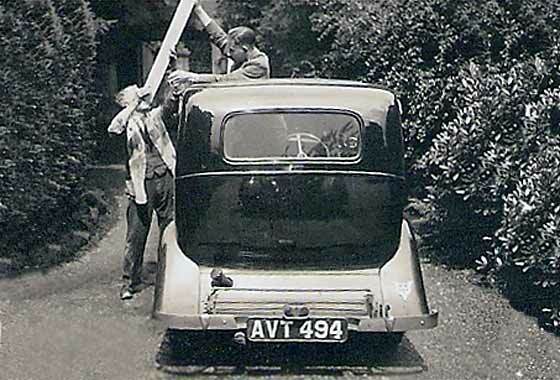 The photo of a 'later car' taken in about 1946 would appear to be a cca 1937 Hillman Minx. Identifying feature is the quaterlight window. 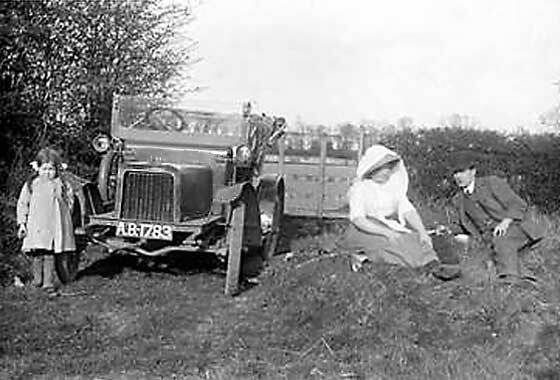 Photo received from Ian Todd (UK) showing a car and Brenda Colvin (garden designer and landscape architect, 1897-1981). 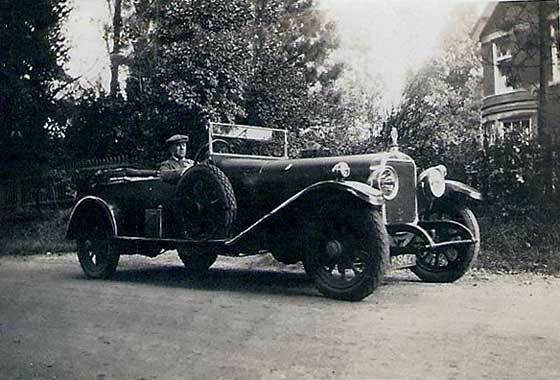 Ian's sister-in-law is currently writing a book about Brenda Colvin who drove this car in 1938 from England to Zywiec in Poland where she was working for Archduke Charles Albert Habsburg on his summer palace gardens. We can advise the car is a 1936 Wolseley 12/48, S2, Sliding Head Saloon. Registration was issued by the London County Council, June/July 1936. 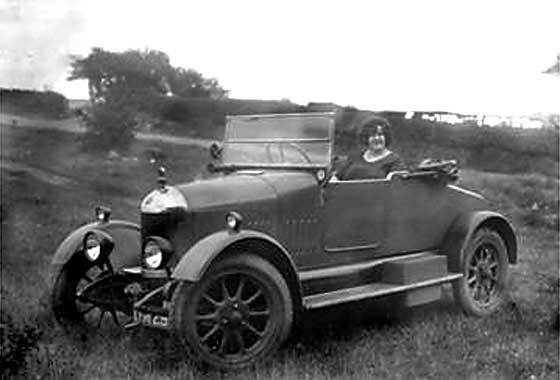 One of a series of photos received from photograph collector David Cox (UK) with a request for dating of the numberplate and for identification of the car. This he thought was a late 1930s Austin 7 Saloon. Nearly right. The car is an Austin but a 1937 Austin 10 Cambridge Saloon. Registration DXA 331 was issued by London County Council during February 1937. Check with the DVLA advises that the car is no longer on their database so unless gone abroad, it has probably not survived. WEDDING CARS : Number of Emails asking if any SVVS Members do weddings. Yes !